Home / The Archives / Sharrows to become federal standard? The U.S. National Committee on Uniform Traffic Control Devices voted last week to recommend to the Federal Highway Administration the inclusion of sharrows in the next edition of the Manual of Uniform Traffic Control Devices. Sharrows are used to show motorists that cyclists may “take the lane” and it helps show cyclists good lane positioning, especially where lanes are too narrow to share safely. In San Francisco, which studied design and placement of sharrows in 2004, sharrows were shown to improve lane positioning of cyclists and improved passing distance by motorists. Sharrows also cut down on the number of sidewalk cyclists and wrong-way cyclists. Wide outside lanes and bike lane markings are preferred by many cyclists, but widening lanes is often difficult because they take away parking or sidewak space, especially in built-up urban areas where parking is already scarce. The MUTCD is a book published by the Federal Highway Administration and used by state transportation departments for street signs and lane markings. After public hearings, the next edition of the MUTCD is expected to come out around 2010. After that, it can take state transportation departments a few years to adopt the new manual. Read more at Bike Commute tips blog. 1. Will this new federal standard motivate the city DoT to pull back on dedicated bike lane expansion? 2. How will it prevent the biggest cause of bike-cager accidents: dooring? Thanks for the comment, Wheelman. 1. I think the main objection to the sharrows is that it can be a compromise solution. In a city like Chicago with strong cycling advocacy, however, I think it can be thought of as one more tool in the toolbox of good facilities for cyclists. 2. 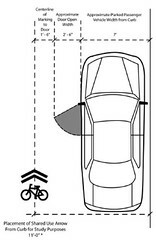 The diagram shows 11 feet from the curb to the sharrow symbol in instance where cyclists ride next to parked cars. That’s outside of the door zone. The problem right now is that with the lack of a standard, sharrows are placed inside the door zone in many cities. Sharrows have been approved and used in Santa Fe, NM with reasonable success. The City has failed to promote them with any followup articles in the Newspaper, so some motorists are unsure what they are…. Although giant chevrons with a bike midlane are not hard to figure out. One problem we have measure from the right is that sub-contractors dont always understand the intent to indicate the cyclist should ‘take the lane’, and place them too close to street-side parking. I believe the placement should be a consistent 5′ from the LEFT of the traffic lane so that motorists are not tempted to pass unsafely. Sharrows are really only needed in cases where there is no room for a shoulder or safe passing… less than 13′ feet or so, and on streets with 25mph speed limits. The idea is that streets with higher speed limits, or wider width, can have striped shoulders or dedicated bike lanes. My little town of Lafayette CA has just painted sharrows on the one busy street in town. This street has parallel parking along most of its length, and in places lanes that are only about 11 feet wide. I ride down this street on my bicycle every day. My only complaint is that the paint used is the thick epoxy stuff, and the sharrows work like rumble strips, so I am inclined to avoid riding over them. As an experienced bike commuter, I’m in the “bike lanes provide no additional safety benefit” camp, so I don’t care one way or the other if these catch on.